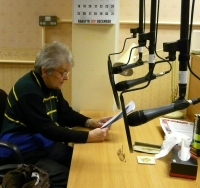 The bi-monthly Carmarthenshire News has been recorded at our studio in Pensarn for some time with nearly 300 recipients for each edition. Carmarthenshire County Council was the first to initiate such a facility and we hope that other county councils will follow. We record a Welsh and an English edition and they are sent out with the Carmarthen Talking Newspaper. We think this a very valuable contribution in distributing information to a wider audience.